Located in the heart of downtown Chicago, this brownfield site was impacted by chlorinated solvents used for a range of manufacturing activities over many decades. Redevelopment is underway to construct a multi-million dollar urban event center and sports arena with adjacent hotel and retail space planned. The affected site stood in the way of the planned redevelopment activities. 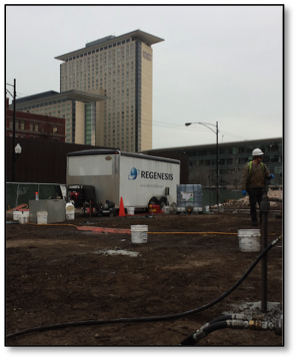 REGENESIS® Remediation Services (RRS) was contracted to treat the contaminated area. An effective combination of PlumeStop®, Hydrogen Release Compound (HRC®) and a bioaugmentation culture, BioDechlor INOCULUM Plus® (BDI Plus), was applied to achieve the remediation targets. At 78 days post-application, the two primary treatment performance wells observed up to 97% reduction in total cVOCs achieving site remediation goals. PlumeStop Liquid Activated Carbon™ is composed of very fine particles of activated carbon (1-2μm) suspended in water through the use of unique organic polymer dispersion chemistry. Once in the subsurface, the material behaves as a colloidal biomatrix binding to the aquifer matrix, rapidly removing contaminants from groundwater, and enhancing permanent contaminant biodegradation. HRC is a controlled release, electron donor material, that when hydrated is specifically designed to produce a controlled release of lactic acid. The newly available lactic acid is critical for the production of hydrogen to fuel anaerobic biodegradation processes in soil and groundwater. By the first monthly monitoring event, the performance wells met the remediation objective and continued to maintain cVOC reduction throughout the monitoring period.